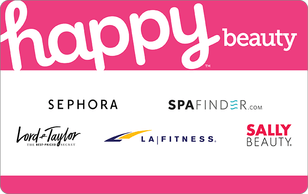 Get more choice and flexibility with multi-store gift cards for all of your "Happy" occasions! When it comes to gift cards, there are two things that people often tell me they want. The first is flexibility. Recipients want a choice in how they redeem their gift cards and givers want the same thing. We want to know that the gift cards we give will be appreciated and will get used! The second thing people tell me they want is “a gift card that does not cost more” (than the value loaded onto the gift card). Happy Card gift cards provide BOTH of those benefits. Additionally, I like that multi-store gift cards, like Happy Card gift cards, create less dependency on any one merchant. If one of the stores listed on the card is not conveniently located, a restaurant does not suit the recipient’s taste or a company listed on the card goes out of business, Happy Card holders can simply redeem their gift cards at any of the other places listed on the cards. The more ways a consumer can use a gift card the more likely the gift card is to be used. As a consumer guide to gift cards and one who regularly helps people figure out what to do with unwanted gift cards, I find this increased freedom very appealing. Happy Cards are available in stores and will be available on GiftCards.com very soon. Below are my tips for giving and using Happy Card gift cards successfully! 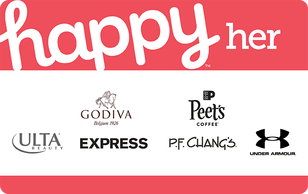 Where Can I Use Happy Card Gift Cards? Can Happy Card Gift Cards be Used in Stores and Online? 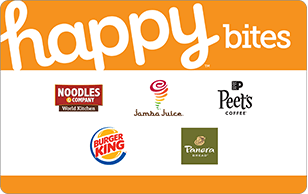 Can I Use My Happy Card Gift Card in More than One Place? Yes! 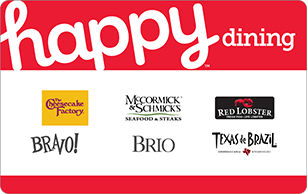 One of my favorite things about Happy Card gift cards is that you can use a Happy Card gift card at any of the stores or restaurants listed on the card, and you can even use it at more than one place if you have enough money. 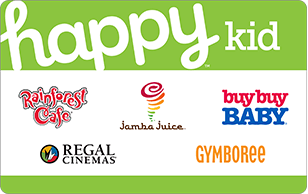 Teens, for example, can use the Happy Teen gift card to pay for a movie at Regal Cinemas and then use it to pay for a smoothie at Jamba Juice afterwards. Each recipient can create the experience he or she wants. Should I Say the Happy Card is a Debit, Credit or Gift Card? Although Happy Cards are gift cards, they MUST be used as “CREDIT” cards at checkout. When you get to the cashier, ask to “ring the card as credit” rather than a gift. Do Happy Card Gift Cards Expire? What is the Valid Thru Date? Like Visa®and Mastercard® gift cards that are usable at many stores and restaurants, Happy Card gift cards have a card number, “Valid Thru” date and “CVV2” (Card Verification Value) listed on the back of the cards. The funds, however, DO NOT EXPIRE. 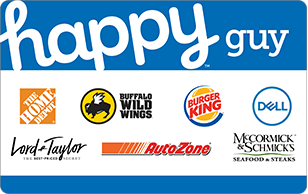 If the “Valid Thru” date on your Happy Card gift card has passed, visit HappyCards.com or call 855.606.3494 to get a replacement card. How Do I Check My Happy Card Balance? 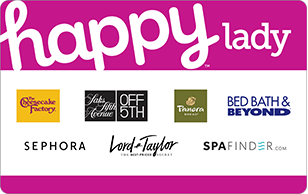 Visit HappyCards.com or call 855.606.3494 to check the balance of your Happy Card. Can I Get a Replacement if I Lose my Happy Card Gift Card? Like other gift cards, Happy Cards will not be replaced if lost or stolen. If you have the card number and proof of purchase, however, you may contact customer service at HappyCards.com or call 855.606.3494 to see if the card funds have been used. 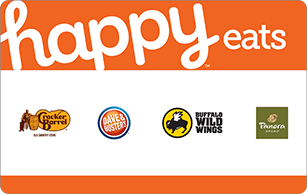 Where Can I Get Help with My Happy Card Gift Card? Contact customer service at HappyCards.com or call 855.606.3494 for help with your Happy Card. Can I Add Money to My Happy Card Gift Card? Happy Card gift cards cannot be reloaded with additional money. However, do not throw a depleted Happy Card Gift Card away until you are certain that items purchased with the card will not be returned. Often times stores automatically credit the card used to make the original purchase when an item is returned. You will need to have the card available in order to access the refunded amount. What if My Purchase is Greater than the Happy Card Balance? If the purchase is greater than the balance of the Happy Card, ask the cashier to charge the exact amount available on the card and then pay the balance with another form of payment. Hi, I’m Shelley Hunter, Gift Card Girlfriend at GiftCards.com and I’m super excited to talk to you about a new type of gift card available. They’re called Happy Cards! They’re for all for all of your happy occasions–Happy Anniversary, Happy Birthday, Happy Graduation, Happy Mother’s Day, Happy Father’s Day, Happy Holidays! If you have a reason to celebrate, then I hope you will check out the new Happy Cards. Here’s what I love so much about Happy Cards. They combine the best of what people are always asking me for. People want gift cards with choices. They want a few different places that they can use their cards so they can spend them how they want, but they don’t often want to pay extra for that flexibility. With Happy Cards you don’t have to. Happy Cards are usable at any of the stores and restaurants listed on the cards. So we’ve got Happy Teen, Happy Kid, Happy Guy, Happy Lady, Happy Dining, Happy Local Eats, Happy Bites and more. Lots of of different gift cards available with a whole different collection on each card. 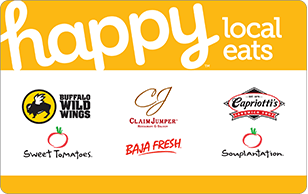 So I just bought the new Happy Bites card over at Lowe’s while I was shopping for some other things because it has a bunch of fast casual restaurants that my kids enjoy. So I bought the gift card over at Lowe’s and then I went over to Panera to show you how easy it is to use the Happy Card at Panera. Now here’s a tip! When you get to the cash register to use your Happy Card, these cards will have to be run as a credit transaction. You don’t need to worry about it, it’s written on the card so the cashier will have instructions. But just so you know ahead of time, even though you’re holding what you know to be a gift card, the cashier will have to run it as a credit transaction. So when I got to Panera I simply told them I had a new Happy Card to spend, we looked at the instructions, and I just had to key enter the card number as a credit transaction. And you might have to enter an expiration date as well. But don’t worry, the funds don’t expire and there are no fees associated with these gift cards. So if you have a celebration coming up, a birthday, an anniversary, or somebody you want to thank with a gift card, then check out the new Happy Cards. I think you’ll really like them. If you have other questions about Happy Card gift cards, visit HappyCards.com or leave a comment below. Have Questions about Happy Card Gift Cards?